Today Rm 6 had done The Yoghurt Challenge.Have you try the yoghurt challenge?We were in class in literacy our teacher Miss Scanlan Explain what is the yoghurt challenge. 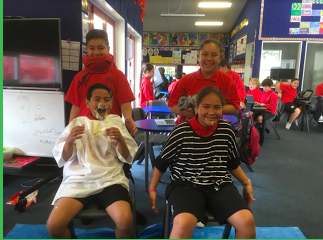 The Rules when 2 people blindfolded behind the person in front and then the person in front sit on there hands and put a shirt on them just in case the yoghurt fall on their school shirt and pants & shorts. It’s not easy to win you have to keep your face clean but they don’t know where their mouth so they just go for it.You have to clear your face. Arthur & Leone and Paige & Madison was in the start leone won’t stop missing arthur mouth so he put it on his nose,eyes hair but Arthur knock the yoghurt off leone hands and drop onto the ground. Some of the yoghurt fell on me my hair, eye, pants and shirt but the yoghurt splash on the other people eyes,jumpers and pants. 5,4,3,2,1 everything was stop mess was still there.The winner is Paige & Madison. Paige was the cleanest and Arthur and Leone was the messy. Photo of your working out. o you know how blueberries grow? They grow on bushes. Each blueberry is small and round. Many blueberries can grow on one bush. At first, the blueberries are green. The green berries are not ready to eat yet. They need a lot of sun and rain to help them become fat and sweet. When the berries turn blue, they are ripe and ready to be picked. Some farmers grow blueberries in big fields. The people who live nearby can earn money by helping to pick the blueberries. Each one takes a pail out to the field and fills it with blueberries. They work fast so that they can fill many pails. They want to earn as much money as they can. When they are done picking, their fingers are blue from the juice of the berries! After the blueberries are picked, they are put into boxes and sent to stores. People buy the blueberries and take them home to eat. Some people like to wash the berries and eat them one by one. Other people like to cook with blueberries. They make blueberry muffins and pancakes. No matter how you eat them, blueberries taste great! What color are the blueberries BEFORE they are ready to be picked? Where do the blueberry pickers work? What happens to blueberries AFTER they are picked? They are put into boxes. They become sweet and ripe. What could be another title for this story?